MONTGOMERY, Ala., Sept. 20, 2018 – With the 2019 Hyundai Santa Fe being named a TOP SAFETY PICK+ and the 2019 Accent being named a TOP SAFETY PICK by the Insurance Institute for Highway Safety (IIHS) today, Hyundai now has the most combined TSP+ and TSP-rated vehicles in the automotive industry. The Santa Fe trophy will be presented to Hyundai at a celebration at its Hyundai Motor Manufacturing Alabama assembly plant tomorrow, where the Santa Fe is made. To qualify for 2018 Top Safety Pick+, the 2019 Santa Fe earned good ratings in the driver-side small overlap front, moderate overlap front, side, roof strength and head restraint tests, as well as a good rating in the passenger-side small overlap front test. It also earned superior rating for front crash prevention and a good headlight rating. To qualify for 2018 Top Safety Pick, the 2019 Accent earned good ratings in the driver-side small overlap front, moderate overlap front, side, roof strength and head restraint tests, as well as an acceptable rating in the passenger-side small overlap front test. It also earned a superior rating for front crash prevention and an acceptable headlight rating. Santa Fe’s and Accent’s awards adds to the list of ten new Hyundai models that are rated TOP SAFETY PICK+ or TOP SAFETY PICK when equipped with front crash prevention and specific headlights, the most in the industry. The 2018 Kona (built after May 2018), Elantra (built after Dec. 2017), Sonata (built after Sept. 2017), 2018 Santa Fe and the 2018 Santa Fe Sport (built after June 2017) all earned the organization’s highest rating, while the Elantra GT, Ioniq Hybrid and Tucson received a TOP SAFETY PICK rating when equipped with optional front crash protection and specific headlights. Hyundai’s standard Rear Cross-Traffic Collision-Avoidance Assist (RCCA) puts eyes in the back of drivers’ heads. When backing up, the Blind Spot Detection system may warn the driver if vehicles approach from the rear side and may also apply the brakes automatically. Additional safety features include the optional Rear Occupant Alert, which Hyundai is debuting with the 2019 Santa Fe. The system monitors the rear seats using an ultrasonic sensor that helps to detect the movements of children and pets. The system first reminds drivers to check the rear seats when exiting the vehicle with a message on the center instrument cluster display. If the system detects movement in the rear seats after the driver leaves the vehicle and locks the doors it will honk the horn and send a Blue Link alert to the driver’s smartphone via Hyundai’s Blue Link connected car system. The system is designed to help prevent children and pets from being forgotten in the car, but it also helps in case children accidentally lock themselves in the vehicle. The 2019 Santa Fe also features Hyundai’s first standard Safe Exit Assist system. To enhance the safety of Hyundai’s passengers, Safe Exit Assist uses radar to help detect cars approaching from the rear and cautions passengers looking to exit the vehicle. If a passenger attempts to open the door when a car is approaching from behind, a visual and acoustic warning on the center cluster may alert the driver. In addition, if the driver attempts to deactivate the Electronic Child Safety Lock feature, Safe Exit Assist will override the driver and ensure the rear doors remain locked until the approaching vehicle has passed. Once the road is clear, the driver can then deactivate the Electronic Child Safety Lock and successfully unlock the rear passenger doors. Accent offers a wide array of advanced safety technologies to provide another layer of protection for passengers. For example, Accent offers available Forward Collision-avoidance Assist that utilizes a front forward facing radar to help detect a vehicle and warn the driver of a potential collision. If the driver does not react to avoid the impact, the system may apply emergency braking. A six-airbag system is standard, along with Electronic Stability Control, Vehicle Stability Management, Traction Control and ABS. Have you stopped by Gary Rome Hyundai to pick up your FREE Drive Pink license plate frames yet? You can stop by during any of our regular business hours to have them installed on your vehicle at no cost to you! You don't need to own a Hyundai to get them, either! ANYONE can get these! 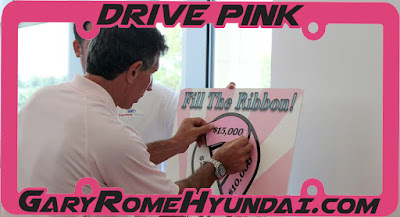 How does our Drive Pink Campaign work? 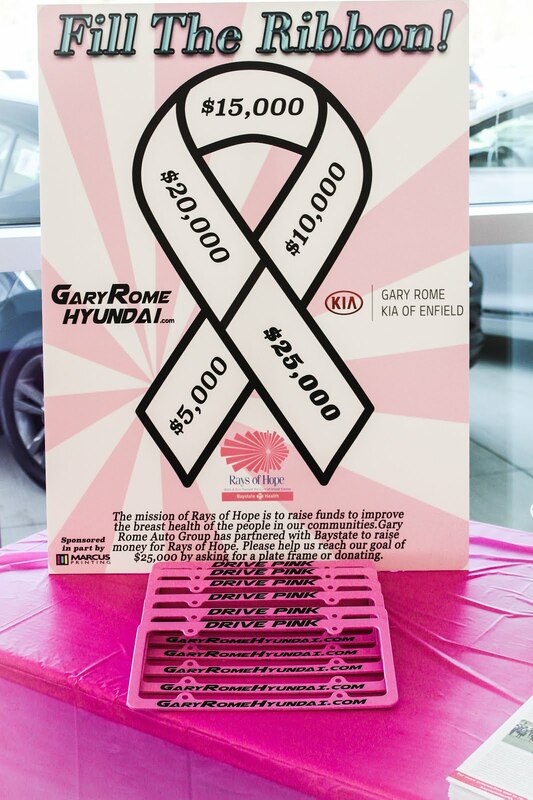 For every license plate frame installed on a vehicle, Gary Rome will donate $5 to Baystate Rays of Hope! 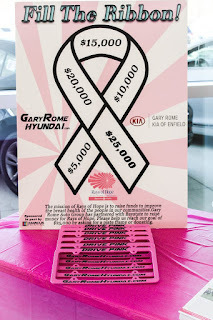 Our goal is to get enough license plate frames put on vehicles to be able to donate $25,000 to Rays of Hope by the end of 2018!! Will you help us reach our goal?! Rays of Hope has been around the Greater Springfield Area since 1994. It was created to help women and men in their fight against breast cancer by walking alongside them on their breast cancer journey. 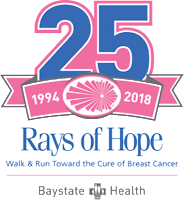 Through Baystate Health Breast Network, Rays of Hope is able to care for people from the time of diagnosis and beyond. All money received into Rays of Hope is kept at a local level in Western Massachusetts and Northern Connecticut. 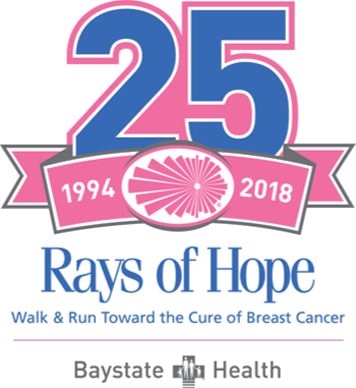 They support cancer research at their Rays of Hope Center for Breast Cancer Research where they have state of the art equipment and health and education programs. Hyundai just took the wraps off the new redesigned 2019 Elantra, a handsome 6th-generation sedan available this fall with many safety and convenience technologies via Hyundai SmartSense. These include forward collision-avoidance assist, lane-keep assist, driver attention assist and even safe exit assist, which sounds an alert when a vehicle approaches from behind to let passengers know it may not be safe to open the door to exit the vehicle. Most of these technologies have been added to the SEL trim level and above, which means they’ll be available on 75 percent of the Elantra lineup. Hyundai has also added SmartSense safety features to the Elantra SEL, Value Edition, Eco, Limited and Sport (SEL and above) levels of trim. Other updates to the 2019 Hyundai Elantra include new wheel designs and LED headlights on the Limited and Sport models, plus a new center instrument cluster and handy tech such as wireless smartphone charging. This new Elantra also marks the debut of Hyundai’s AVN 5.0 infotainment, which features an upgraded processor and available 8.0-inch screen (compared to the 7-incher in the previous Elantra). Apple CarPlay and Android Auto are available with AVN 5.0, and Hyundai says the AM, FM and SiriusXM channels are now all combined onto one screen, which makes changing stations with the presets a breeze. The 2019 Hyundai Elantra has two engines that focus on fuel efficiency and a third that will give the Elantra Sport (which will arrive later in 2018) plenty of pep. The base powerplant in the Elantra SE, SEL and Limited is an Atkinson-cycle 2.0-liter 4-cylinder that produces 147 horsepower and mates to a 6-speed manual transmission or a 6-speed automatic. The Eco model is powered by a turbocharged 1.4-liter 4-cylinder that sends 128 horsepower to the front wheels via an efficient 7-speed dual-clutch automatic that contributes to an impressive EPA Combined fuel-economy rating of 35 mpg. As for the late-arriving Elantra Sport? This Elantra model—with sport seats, paddle shifters, a flat-bottom steering wheel and a multilink rear suspension—is powered by a turbocharged 1.6-liter 4-cylinder engine that sends 201 horsepower to the Elantra’s front wheels via a 6-speed manual transmission. When it arrives this fall, the 2019 Hyundai Elantra will be offered in six trim levels—SE, SEL, Value Edition, Limited, Eco and Sport. While we don’t have official pricing yet, we do know the handsome new 2019 Elantra will be built in Montgomery, Alabama, and Ulsan, South Korea. The 2018 Elantra Eco, Sonata Hybrid, and Ioniq are listed as “Top Commuter Cars” (Under $35K category) in a new study from CarGurus. The newly released “Top Cars For Your Commute” study weighs factors such as commuting efficiency, mileage variation, hilliness, and weather of 84 different metro regions and matches them with cars that excel in vehicle efficiency, horsepower, comfort, and even alternative-fuel options that thrive in each commute. Elantra Eco was named the “Top Commuter Car” in 13 cities, while Ioniq was named a top choice in three, and Sonata Hybrid was deemed a top car for the unique conditions of New Orleans’ commute. CarGurus sourced data for its “Top Cars For Your Commute” recommendations by calculating average distance from home to work for commuters who work in 84 of the largest U.S. metro areas. The average distance was calculated from the Census Transportation Planning Products, while the travel and efficiency information was adapted from the Texas A&M Transportation Institute’s Urban Mobility Scorecard. CarGurus grouped metro areas with similar characteristics to form its commuting clusters for use in the study, and then its editorial team chose cars with features that fit each group, including one option above a $35,000 MSRP and one below. The survey fielded more than 1,800 people ages 18+ who identified as employed individuals or students. Hyundai Motor AmericaHyundai Motor America is focused on delivering an outstanding customer experience grounded in design leadership, engineering excellence, and exceptional value in every vehicle we sell. Hyundai’s technology-rich product lineup of cars, SUVs, and alternative-powered electric and fuel cell vehicles are backed by Hyundai Assurance — our promise to deliver peace of mind to our customers. Hyundai vehicles are sold and serviced through more than 830 dealerships nationwide, and the majority sold in the U.S. are built at U.S. manufacturing facilities, including Hyundai Motor Manufacturing Alabama. Hyundai Motor America is headquartered in Fountain Valley, California, and is a subsidiary of Hyundai Motor Company of Korea.